Tower Quake is an asymmetric tower builder earthquake simulator featuring both sound and seismic waves. One player builds up an earthquake by playing a rhythm game with a USB drum set while the other constructs a tower. After a minute, the tower is subjected to the earthquake. 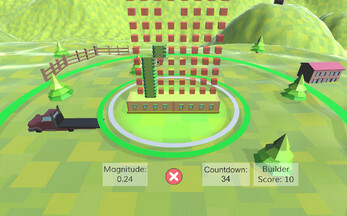 Points are awarded based on how many blocks remain on the base at the end of the earthquake. You can use the number keys 1, 2, 3, 4 if you want to play with a keyboard or if you don't happen to have a set of USB/Rockband Xbox drums sitting around. I made this game as part of an 8 person team for the 2017 Global Game Jam (theme was waves) at the Calgary location. Check out the GGJ project page here: http://globalgamejam.org/2017/games/tower-quake.